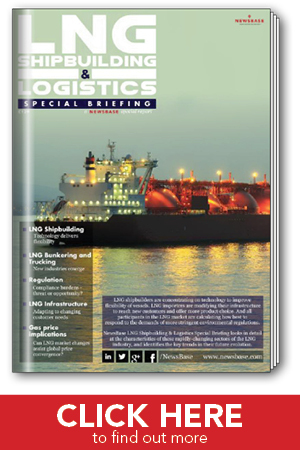 The NewsBase LNG Shipbuilding and Logistics Briefing 2014 takes a thematic look at the sector in Europe in order to assess critical questions. Normal price £129. Special 10% launch discount during August. 1. What is the present status of LNG shipbuilding, including LNG carriers, FSRUs and fuelling and storage barges? Who is buying the vessels and who is building them? 2. What is the current state of the market in terms of construction of port and docking facilities to facilitate LNG supply to vessels and hauliers? 3. What is the present state of the bunkering sector? Who are the main players what are the main regional and global trends? 4 How is emissions and clean air legislation driving the use of LNG as a transport fuel? 5. What are the implications of shipping and logistics developments on the global gas market, and how will LNG prices affect shipbuilding and freight costs? Floating technology and dual-fuel engines demonstrate how innovation and flexibility are driving the LNG sector.